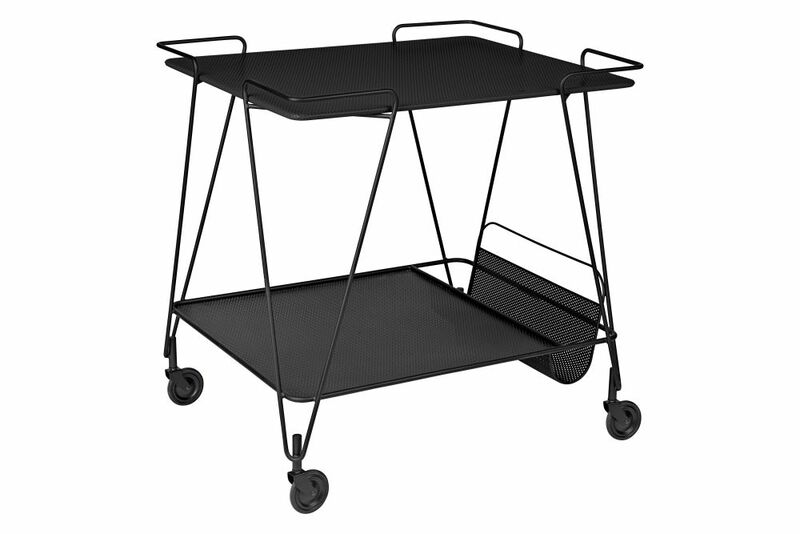 The spacious Matégot Trolley is adorned with two trays, the upper available in the different colours and the lower in black and includes a newspaper holder that proves, with its bent metal design, the technique's strength of being flexible as tulle and strong as metal. The lightness it evokes is improved by its rolling castors and makes it float along the floor. Mathieu Matégot (1910 - 2001) was a Hungarian designer and architect. After studying at Budapest's school of art and architecture, he settled in France in 1931. He was a volunteer in the French army, was captured and not released until 1944. After returning home, he started producing handmade furniture in Paris. Matégot's organic forms and lightness of touch create a sense of joy and the ground breaking and innovative techniques that he applied resulted in unique aesthetics and furniture designs. He was the first person to combine metal tubing with perforated sheet metal; ritigulle, a technique he patented and also a pairing that particularly characterizes his work. Like many of his peers Mategot travelled the world in search of inspiration, techniques and upon return transformed these impressions into his own unique designs and interpretations. Wether it was industrial processes or aesthetics, he always collected and interpreted - he even patented and set up his own production to apply these new technologies into his designs, He was a true innovator of his time! In the 1950's - also the one decade - that he devoted to the design of furniture and interior accessories, he created a wide range of distinctive designs that today is considered iconic and contemporary. To ensure quality in the production of his own designs - Matégot set up two of his own workshops - Société Mategot, one in Paris that employed up to twenty workers and a second in Casablanca, Morocco. Both manufactured in limited numbers for up to 200 items and continued until 1959 when Mategot abruptly ended his production and began his work on tapestry, which he would continue for the rest of his career.